Now onward! 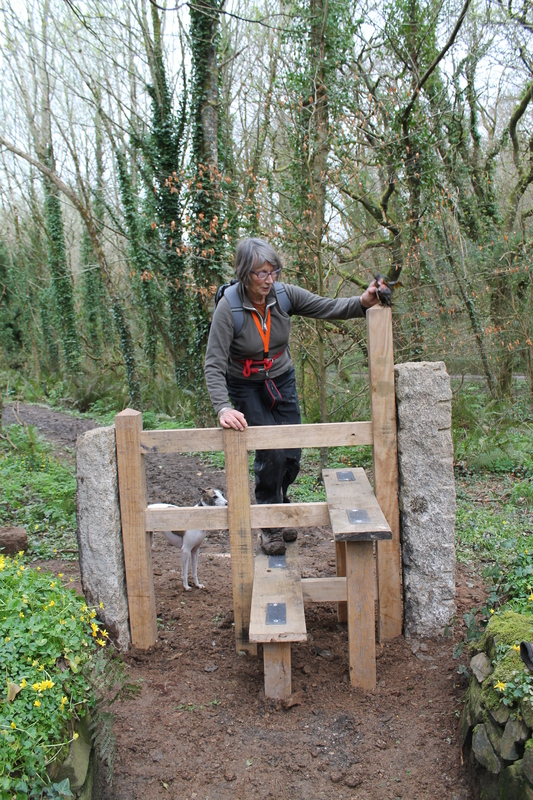 There’s no time like the present…..
At Trelissick and on the North Helford, it is no longer the home fires of the estate or the requirements of tanners and boat builders that we must fulfill. 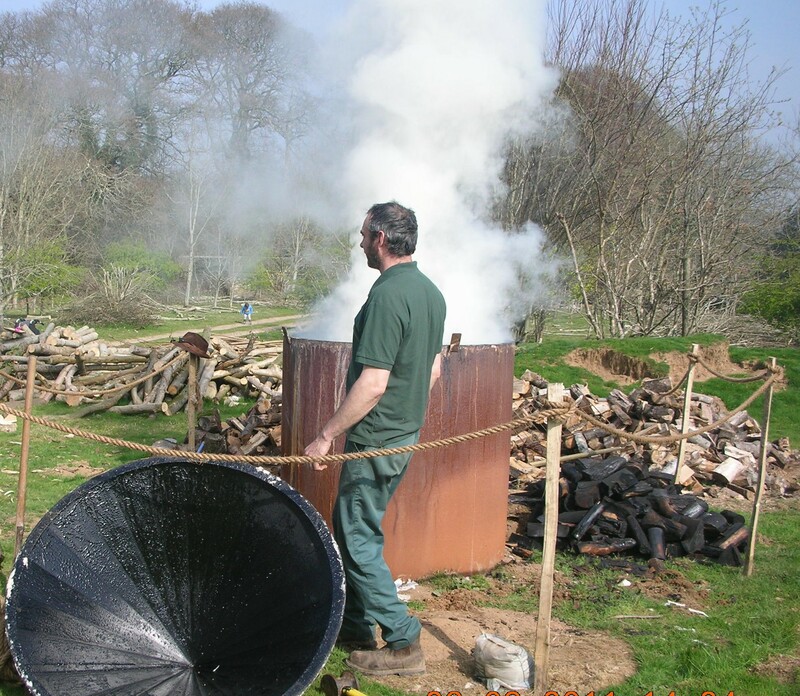 Each year, we produce the firewood needed to fuel every National Trust holiday cottage in the ‘Heart of Cornwall’ area, the tea room at Glendurgan Gardens and the ‘Fish Cellar’ down in Durgan village itself. 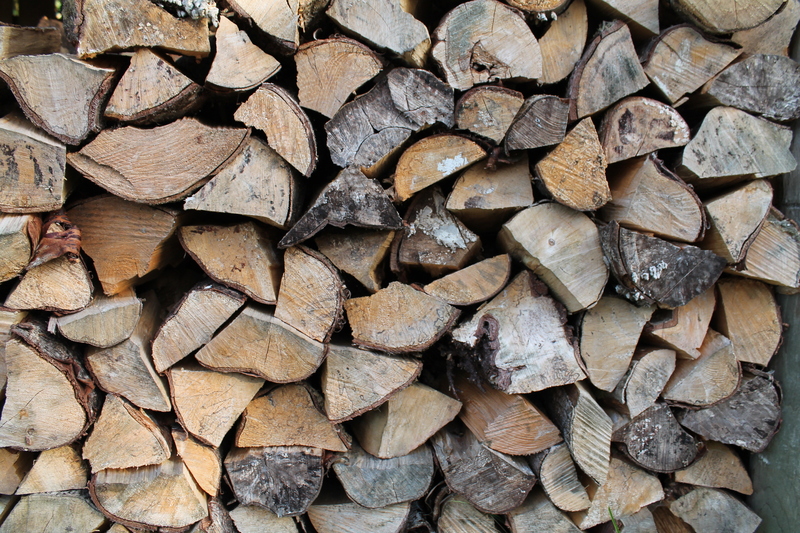 We also produce charcoal, usually from varieties of wood less prized for their combustible properties, which is available to our guests in the holiday cottages over the summer months. 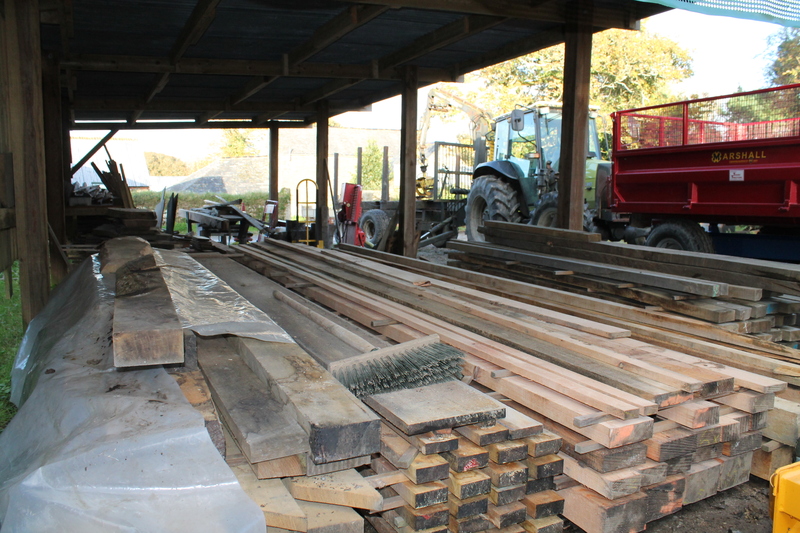 Additionally, a large proportion of the structures – kissing gates, post and rail fences, notice boards – that can be seen throughout the estate are made by the ranger team from our own milled timber. Oak and chestnut are prime candidates for this purpose because the high volume of tannic acid found naturally in this wood increases the durability of the materials, once in the ground. Of course, it must be stressed that our focus is primarily on the conservation of the woodlands and the incredible range of unique and specialised wildlife they can support – All of this produce is a product of our ongoing, sustainable woodland management and all money raised is re-invested into staff and equipment for the future management of the woodland. Our thinning and clearance work usually begins in January and carries on through to the beginning of the British bird nesting season on the 15th March when we stop all felling until the following winter. Why do we favour the sessile oaks? Much of our activity revolves around the restoration and retention of our characteristic oak fringe woodland which surrounds the river banks and is a designated Site of Special Scientific Interest (SSSI). The work involves coppicing the holly understory and removing beech seedlings or non-native trees to encourage oak regeneration. 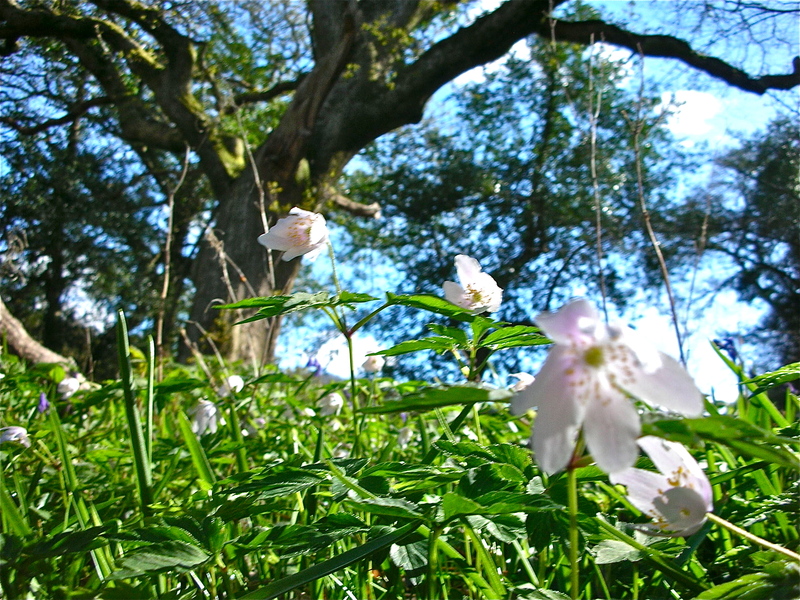 The oaks form an ‘open canopy’ woodland (as opposed to the more dense and shade-casting canopy of beech), thus allowing more light to reach beneath, encouraging woodland wildflowers like bluebells and wood anemones, and all the pollinators and predators that go hand in hand with such an ecosystem. Longer term, this clearance also encourages the re-growth of heather along the edges of the creeks which is a classic feature of Cornish estuary woodlands. At Trelissick, we also have the only recorded site on the river for the very rare barbastelle bat which is dependent on these ancient oak woodlands. After the birds have decreed that we must cease our infernal racket and put down our chainsaws, we are left with the unenviable task of removing all that we have cut, often from highly inaccessible woodlands of sensitive flora and fauna. What to do? A great rumbling tractor is not always appropriate, with the woodland floor and all those tree roots suffering as a consequence of its use; so this is where Jimbo the heavy horse comes in. 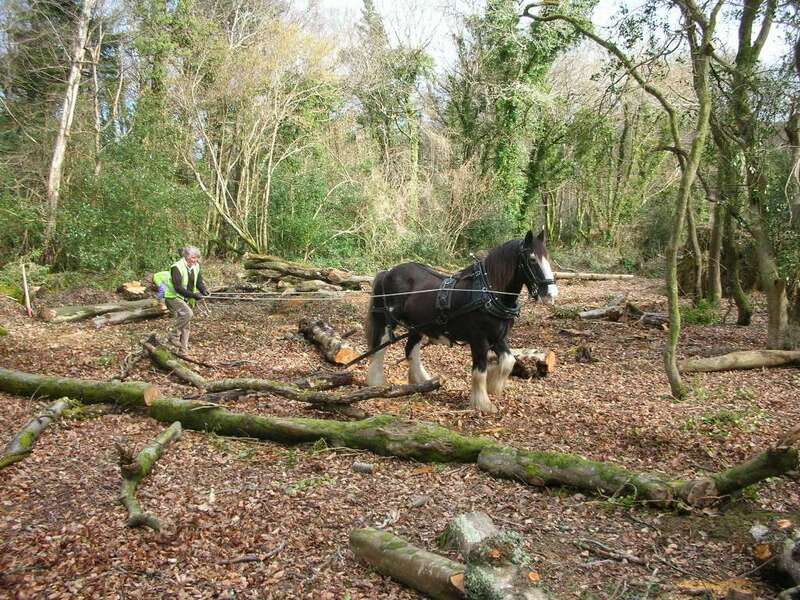 Almost every year (especially when we have been working at Roundwood, which is a Scheduled Ancient Monument where the archaeology must not be disturbed), the horse loggers come to Trelissick and fit Jimbo with an Amish-made harness to haul out our timber with the minimum of disturbance or noise. He might be slower than a machine, but he is also a lot quieter, more gentle and a lovely sight to see working in the woods. For nigh-on a decade, a great deal of focus and effort has been given to the widespread removal of rhododendron from British woodlands. This is because these plants are known to carry a plant pathogen called Phytopthora ramorum or sudden oak death as it is more commonly known. 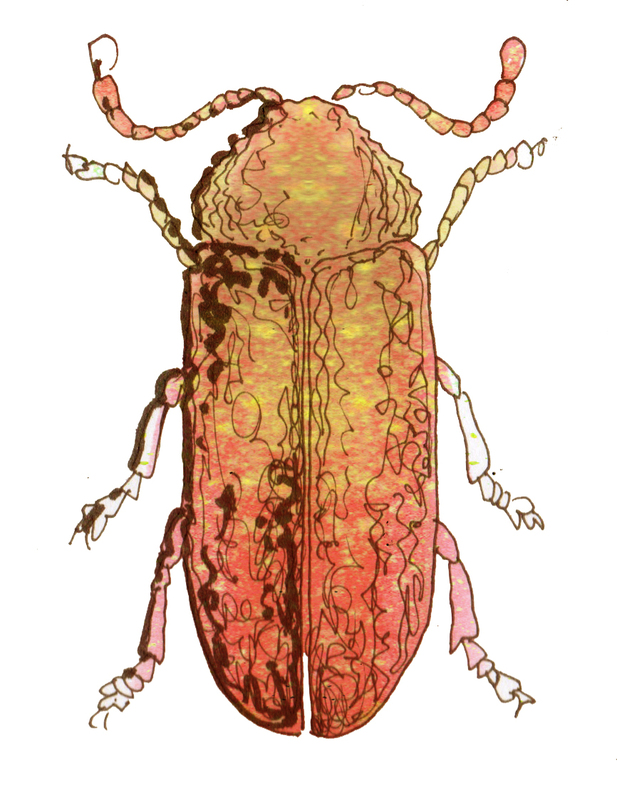 This disease kills oak trees and, before reaching Britain, has had a devastating effect on the oak populations of California and Oregon. The woods at Trelissick used to be riddled with rhododendron but, through sustained cutting, removal and stump treating, our woodlands are almost completely free from these plants and therefore of the threat Phytopthora poses to our oak trees. Meanwhile, on the ‘other side’…. Over at Turnaware, on the opposite side of the river from Trelissick, we are in the process of gradually converting an old coppice oak woodland (which would have been historically managed for produce) into a natural high forest. This work was begun by selecting a large number of trees that possess the vitality and strength to grow onto large size and ‘haloing’ around them to increase the amount of light reaching those that are favoured, prompting an increase in growth and often crown size. The term ‘haloing’ refers to a process where the trees growing around or over the tree which is being ‘haloed’ are gradually reduced in size and reach. This is to clear both space and light (light for growth, space to grow into) around the selected individual. The damage caused by grey squirrels is our other major motivation for carrying out thinning. Unfortunately a very large percentage of our younger trees, both at Trelissick and in woodlands such as Carwinnion on the North Helford, have been decimated by the bark stripping activity of these non-native mammals. 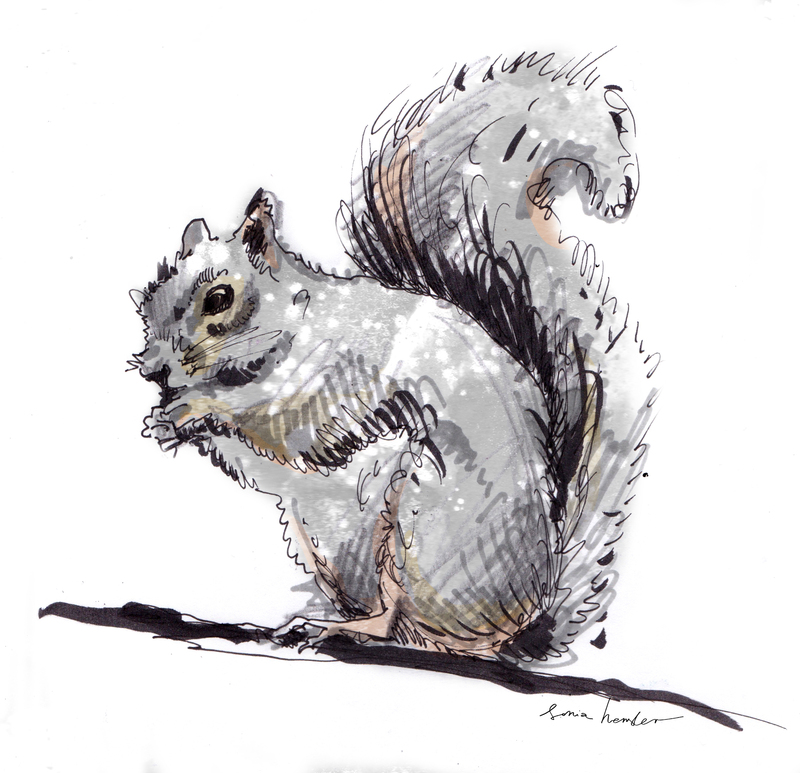 The majestic, mature trees that we so enjoy today will all pre-date the introduction of grey squirrels during the late 1800’s and will have been able to mature without the crippling influence of these animals. Our thinning work will hopefully protect the oaks we have on the property, both young and old, because grey squirrels tend to find open spaces threatening and favour dense woodland. When we carry out our forestry work each winter, we try really hard to leave behind as much material as possible; from single logs to full tree-lengths of wood – left to rot down and return to the earth. All of the brash (the smaller branches that form the tree’s crown) is used to make ‘habitat piles’. These piles of sticks (which we saw up really small to make them as dense as possible) offer shelter and protection to mice and a haven for hibernating hedgehogs; they offer food-a-plenty for beetle and invertebrate larvae that feed on the wood; they are colonized by an array of fungi such as witches butter, cup fungi and honey fungus, all of which help break down the materials and recycle nutrients back into the soil. Later, as these brash piles are enveloped by a barbed barrier of brambles, they provide excellent, protected nesting and feeding sites for birds such as the wren and the woodcock (and in a place as popular for dogs as Trelissick has become, these secret places are sorely needed). So, over these two articles, it can be seen that woodland management is an enormously complex area. We are really just carrying on the management of the woodland as it always has been, since these trees were planted (apart from a brief and wayward diversion during the 1800’s that gave us grey squirrels and rhododendrons). The difference is that we have the luxury that comes with working for a unique charity like the National Trust; we can favour wildlife over productivity and have the backing and support of a large organisation which enables us to actively manage the woodlands in a positive, sustainable and sensitive fashion. This is really just the tip of the iceberg – we haven’t covered the management of veteran trees (the really, really old ones) or the rigorous tree surveys we carry out for visitor safety throughout the estate. Who knows? Maybe there will be a part three…..but I think we’ll spare you that. Mid-summer is a riot of colour!